MetalRockNews: Megadeth's David Ellefson about Metal Allegiance's Lemmy tribute: "It was really a moving moment"
Megadeth's David Ellefson about Metal Allegiance's Lemmy tribute: "It was really a moving moment"
Megadeth bassist David Ellefson was recently interviewed by "About Heavy Metal", you can read some excerpts below. About Metal Allegiance Lemmy tribute, he said: "As it would turn out, Lemmy passed suddenly and unexpectedly just after Christmas, and we got the call from the venue saying, 'Hey, we would love it if Metal Allegiance would accommodate a tribute to Lemmy. You're kind of set up for it with the lineup of the band. There's going to be a lot of guests, and other celebrated metal musicians around,' and we said, 'Absolutely we should do it.' It's a no-brainer. It's pretty easy for us. They had the funeral at Forest Lawn. They had the memorial up at the Rainbow, and we held the wake down at the Whisky." 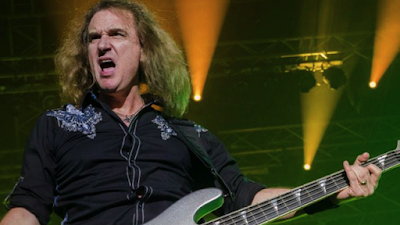 About if it was pretty emotional when Motorhead drummer Mikkey Dee got up there to play a song with Metal Allegiance, Ellefson said: "It was. Mikkey's such a terrific guy, and such a great drummer. In fact, I remember just before we were releasing the 'Peace Sells' record back in 1986, we did a tour leading up to that with King Diamond in the summer of 1986, and Mikkey Dee was the drummer. That was when we in Megadeth first got to meet Mikkey, then, of course, watching him move over to be the Motorhead drummer." He continued: "Motorhead drumming and the Motorhead lifestyle is not for the faint of heart, and he survived both very well. Just such a monster player, and such a cool guy. He held a moment of silence for Lemmy. It was really a moving moment when you get a bunch of loud, raucous, metal heads into a room who are respectfully, honestly giving a moment of silence. It was really a moving moment for sure, and followed by, 'Okay, now let's go make some noise.' Then he hopped behind the kit, and we blazed out a tune. We had some of the best guys there, obviously. Mike Portnoy, Mikkey Dee, Dave Lombardo came down to play drums. Corey Taylor flew over from Las Vegas just to be a part of that, and jumped up and sang some songs with us. Everybody joined in with the best intentions, and really with a big heart in all the things in honor of Lemmy."